This motorcycle has a fuel-injected 1202cc motor, one of the best tach’s, 43mm Showa inverted or “upside-down” cartridge front forks, Nissin 4-opposed-piston caliper brakes, and Harley-Davidsons first cast-alloy swing arm for rear-wheel movement. That was the opinion of the reporter. What is it, you ask? 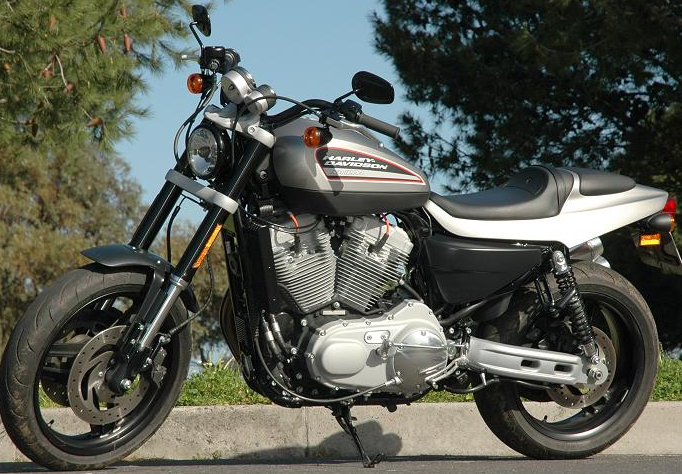 The Harley-Davidson XR1200. The author viewed the bike as neither a cruiser or sports bike. 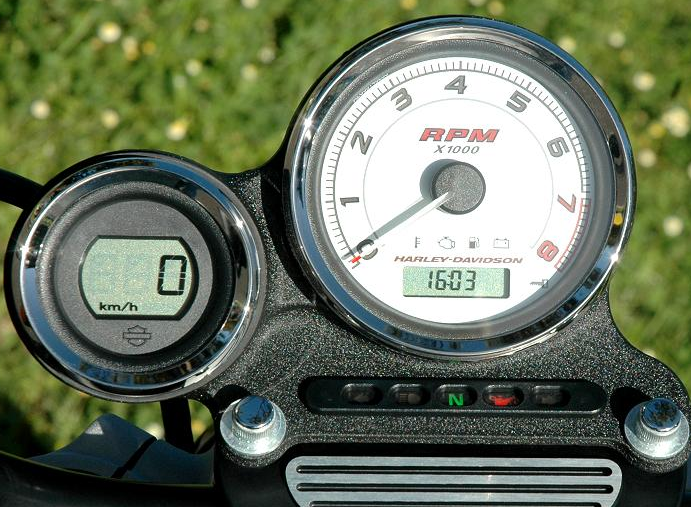 Unavailable in the U.S. market I’ve been trying to find more background information on the motorcycle and ran across this good review from Motoring in South Africa. The road test was in the same area of Africa’s biggest Harley rally and where the 2009 HOG Route 62 Rally will be hosted. I’m thinking this motorcycle will come to the U.S. market next year as Harley tries to extend the brand and if a Buell, Aprillia 750 or Ducati GT 1000 are too radical then this might be the ride for you. What do you think about the motorcycle coming to the U.S.? Send any suggestions or comments to Harley-Davidson HERE. Photos courtesy of Dave Abrahams and Motoring web site. Military life is a lot about adrenaline (shooting weapons, parachuting out of planes, repelling from Blackhawks, etc. ), not to mention the amount of testosterone filled “hoorah” recruits go through during basic that gives many the feeling of invincibility. However, military personnel and motorcycles are a lethal combination as the News Observer reports that since 9/11, more American troops have died in off-duty motorcycle accidents than fighting in Afghanistan. I’m not going to debate if the military personnel buy high-powered motorcycles and hit the streets to burn off adrenaline, testosterone or boredom. Or if it’s due to a lack of maturity, a lack of training or inexperience riding powerful sport bikes. Or if it’s due to psychological stress that lingers returning home from combat. I’m interested, but will leave that to the experts to determine. All military branches of the armed forces have seen significant increases in motorcycle fatalities. As of October 1st, 24 deaths have occurred in the Marine Corp which breaks the previous record of 19 fatalities set the year before. Nine of the 24 were from Camp Pendleton. In 2000, when the Marine Corps started keeping track of motorcycle fatalities, seven riders died. The Marines have had a higher fatality rate than the civilian population, according to Peter Hill, head of engineering with the safety division at Marine Corps headquarters in Washington, D.C.
A survey of motorcycle use in the Marines, has so far counted 17,348 riders nationwide, 56 percent of them on fast sport bikes, and the count is projected to reach about 25,000. Military personnel are required to take a three-day basic rider course or a one-day experienced rider course before they are allowed to ride on/off base. 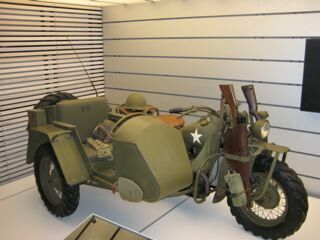 However, most know how to get around the requirement by storing motorcycles off-base either at dealers or friends home. According to the Insurance Institute for Highway Safety, there are about 7.5 fatalities per 10,000 civilian riders. 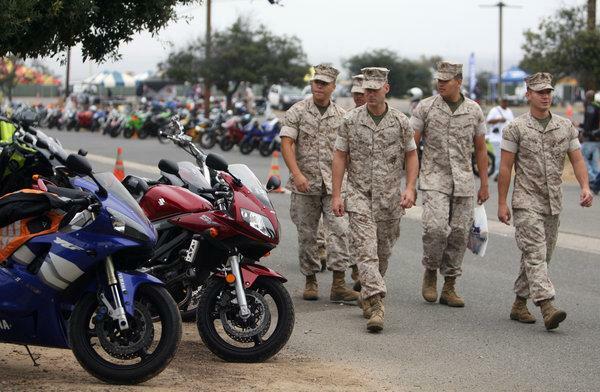 In the Marine Corps, the rate was about 9.5 per 10,000 riders this year, according to Marine Corps statistics. For every mile traveled, motorcyclists are about 32 times as likely to be killed as someone in a car, according to the National Highway Traffic Safety Administration. According to the Insurance Institute for Highway Safety, sport motorcycles generally weigh half as much as a cruiser-style motorcycle and have about twice the horsepower. In the civilian population, the fatality rate is four times higher on a sport bikes than on a cruiser. I’ve written previously on motorcycle safety HERE, HERE and on alcohol related accidents HERE. I’m sadden by the above statistics and especially dislike reading about our young veterans getting injured or killed on motorcycles. Many AFTER they’ve returned from the Gulf. My efforts here are to bring visibility of a growing problem and maybe in some small way help reduce motorcycle fatalities. But, let’s return to the role of the motorcycle dealer and their prevention responsibility, if any. First, I fully believe they have a lot of responsibility as the first line of “defense” so-to-speak and doing a good job of “fitting” motorcycle to customer, but unfortunately know they are also simply a corporation that makes money selling motorcycles and motorcycle accessories. The owners of these dealers and the manufactures they represent want you to believe they are biker’s best friend, but at the end of the day it’s all about business and what will bring them the most sales volume and the best return on their investment. I’m not arbitrarily discounting their genuine desire to avoid or prevent motorcycle accidents, but most all dealer’s have many more requirements to rent/ride a motorcycle from their business than they do to purchase one! Some dealers pass out vouchers for customers to attend local safety classes, but do you think a sales person would ever say… “You are just not ready for that 175mph super bike, let’s put you in a big scooter” or “Sorry, but that chrome laden Ultra Glide is just too heavy a motorcycle for you and might I suggest that you step into a Sporty”. Yeah right like that would ever happen! Yet another example of the great lengths that dealers/manufactures will go to catch the military personnel attention is the rising popularity of motorcycle sales at overseas military exchanges, which offer two American makes, Harley-Davidson and Buell, at bargain prices. After the Afghanistan war started, sales jumped nearly 50 percent, to more than 4,000 a year thru this channel, and have held steady, according to figures provided by the different services’ exchanges. At exchanges in the two combat zones alone, troops bought more than 1,500 motorcycles in 2005 (last year of stats) and took delivery of them on their return to the U.S.
Want more training info? Look at a MSF course which is an intensive two or three day classroom and riding course supervised by expert riders. Or if you’re a veteran be a life-long learner and take a refresher course. Team Oregon has consistently been rated very high in motorcycle training too.